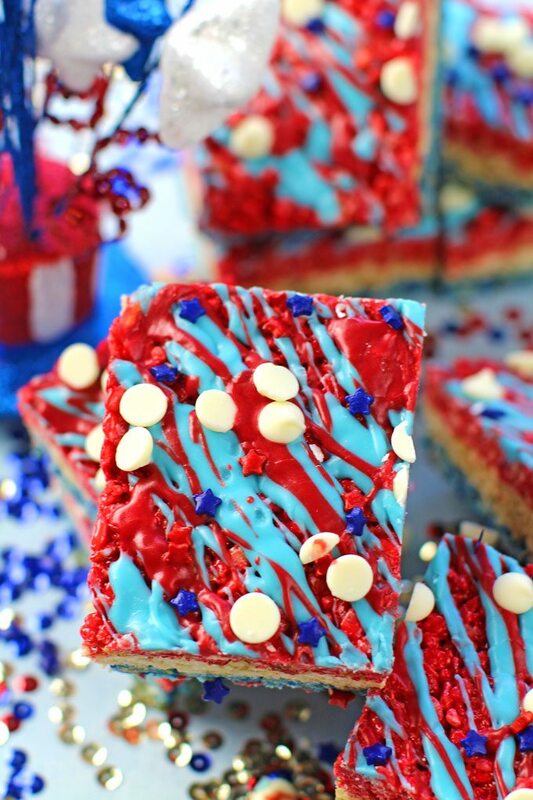 Red White and Blue Rice Krispy Treats are fluffy, sweet and very easy to make. Colored in red, white and blue to look extra festive and fun. 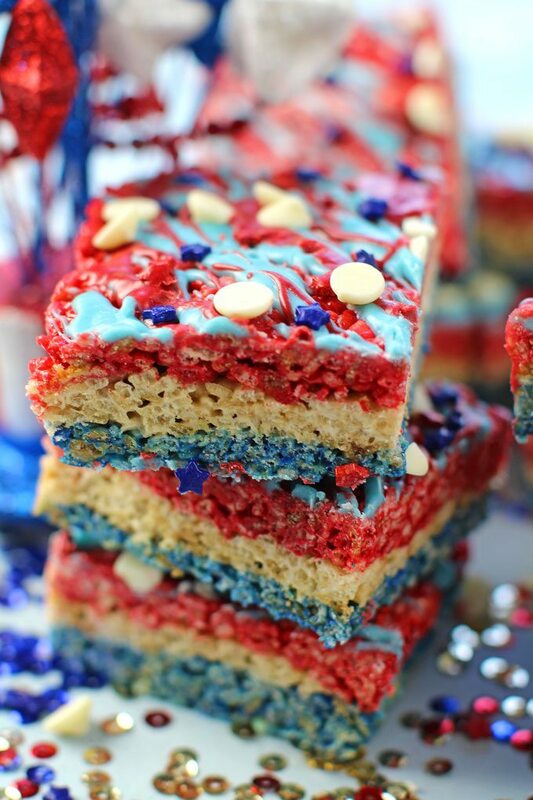 Red White and Blue Rice Krispy Treats are very easy to make and a super fun project with kids. 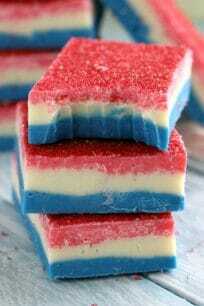 These are colored red, white and blue and topped with blue and red melted chocolate. White chocolate chips are added to resemble stars and festive red and blue sprinkles. Red White and Blue Rice Krispy Treats are the perfect no bake patriotic treat that you can easily take to any party. 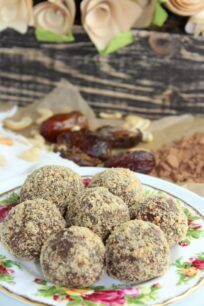 Soft, chewy and fluffy, these are always a hit with kids and grown-ups. How Do You Keep Rice Krispy Treats Soft? Rice Krispy Treats made with extra BUTTER and marshmallows are extra soft. The extra butter adds moisture, so it keeps the treats, softer, chewier and fluffier. It is not recommended to replace butter with margarine. Do You Bake Rice Crispy Treats? No, Rice Krispie Treats are either made on the stove or using the microwave method. How Do You Make Rice Crispy Treats With Marshmallow Cream? You will need 1/2 cup butter, 7 oz Marshmallow Cream and 5 cups Rice Krispie Cereal. Melt butter in 3 a saucepan. Add Marshmallow Cream and cook over low heat. Stir constantly until marshmallow cream and butter are well combined. Add Rice Krispie Cereal and stir until well coated with mixture. How long does Rice Crispy Treats Stay Fresh? Rice Krispy Treats are best consumed in 2 days. To keep fresh for longer see freezing instructions below. Can You Freeze Rice Crispy Treats? Place Rice Krispy treats in a single layer inside a resealable/ziploc freezer bag. Squeeze all the air from the bag and place it in the freezer for up to six weeks. Let Rice Krispy treats thaw to room temperature before serving. To keep treats from sticking together inside the bag, you can layer each rows or wrap each individual treat in wax paper. Freezing Rice Crispy Treats immediately after cooling lets you lock in freshness. How Do I Make Rice Crispy Treats In The Microwave? Add butter and marshmallows to a large microwave safe bowl. Heat on HIGH for 2-3 minutes, stirring after 2 minutes. 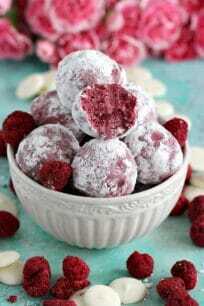 If the mixture is not fully melted, microwave in 1 minute increments until melted. Add Rice Krispies cereal. Stir until coated. Press mixture into 13 x 9 inch pan coated with cooking spray or lined with parchment paper. How Do You Make Square Bars? Make Rice Krispy treats per the microwave or stove instructions. Add the Jumbo marshmallows and stir until completely melted. Stir in Miniature marshmallows and remove from heat when the miniature marshmallows are not yet fully melted. Add the Rice Krispies cereal and stir until well coated. Divide mixture into 3 large bowls. Add about 6 drops of blue gel food coloring to one bowl, and using a spatula mix into the rice kripsy treats mixture until fully combined and blue. Using a buttered spatula, press the blue rice krispy mixture in a 13 x 9 x 2-inch pan coated with cooking spray or layered with parchment paper. Layered with parchment paper is better, as it makes removal from pan much easier. Press the uncolored bowl of rice krispy mixture on top of the blue layer. Add about 6 drops of red gel food coloring to the remaining bowl, and using a spatula mix into the rice kripsy treats mixture until fully combined and red. If mixture starts to harden and is hard to work with, microwave for 1-2 minutes. Press the red bowl of rice krispy mixture on top of the white layer. Melt the red and blue candy melts in separate bowls per package instructions. Drizzle on top of the rice krispy treats. Top with white chocolate chips and start sprinkles. These are so festive! I’m in love! I just LOVE the layers in these krispy treats, and I love the colors, too! So patriotic and fun for next week! What a festive and fun treat! I am always looking for recipes that my kiddos can enjoy making with me. This is a winner! So festive and so much fun for the patriotic season!! What a fun idea for the 4th! And I love the Q&A format of this post – lots of good info. This is so cute and patriotic! 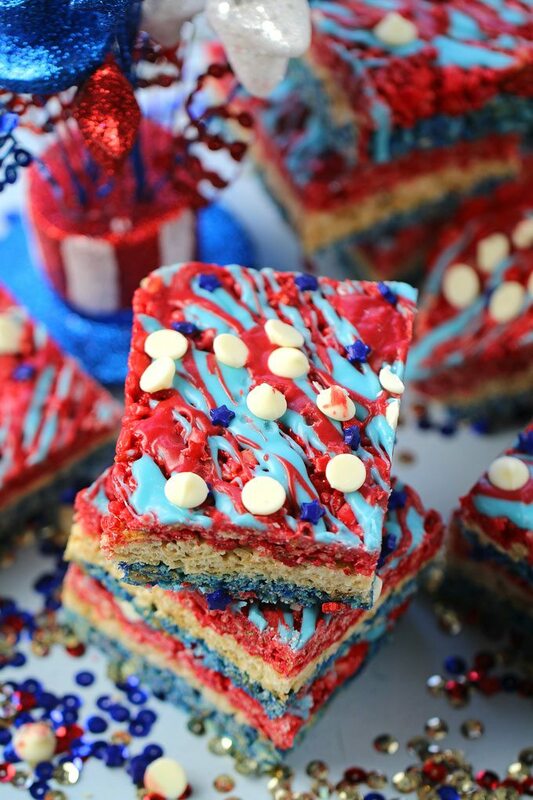 What a fun twist on a common dessert – so perfect for a 4th of July picnic!